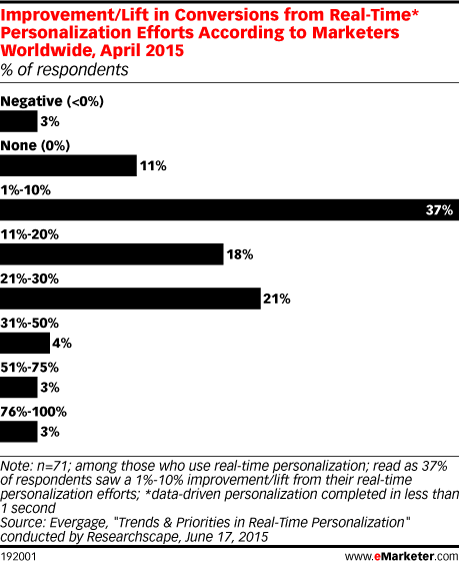 Data is from the June 2015 Evergage report titled "Trends & Priorities in Real-Time Personalization" conducted by Researchscape. 242 marketers worldwide from a variety of industries were surveyed online during March 17-April 29, 2015. Respondents were from Belarus (1%), Brazil (2%), Bulgaria (1%), Canada (6%), Chile (1%), Colombia (1%), Denmark (1%), Estonia (1%), the UK (3%) and the US (75%). Respondents identified their title or marketing responsibility as online/digital/web marketer (21%), marketing manager or staff member (21%), VP/SVP marketing (12%), director of marketing (11%), nonmarketing (9%), CEO/GM/division head (6%), CMO (4%), merchandiser (2%) and other (15%). Respondents identified their company's annual sales as less than $1 million (22%), between $1-$10 million (29%), between $11-$50 million (16%), between $51-$100 million (9%), between $101-$500 million (7%), between $501 million-$1 billion (7%) and more than $1 billion (9%). Respondents identified their company as B2B (49%), B2C (22%) and both B2B and B2C (29%). Evergage is a platform that provides real-time web personalization. Researchscape is a market research publisher.